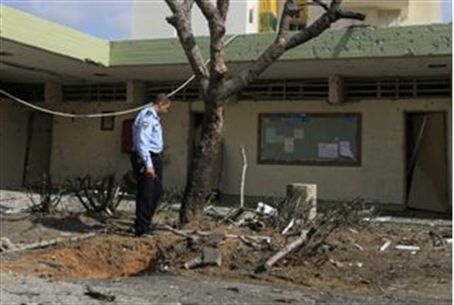 Gaza terrorists fired a Grad rocket at the city of Ofakim on Friday for the first time since Cast Lead. On Thursday night, terrorists fired a short-range Kassam rocket at the Eshkol region. No injuries were reported. A third rocket was fired on Friday morning, but apparently landed within Gaza. On Wednesday, the Al-Qaeda inspired Gaza-based terrorist group Army of Islam vowed revenge on Israel after troops killed two senior terrorists who were plotting attacks on Israelis in the Sinai Peninsula. The two terrorists, Islam Yassin and Jamal a-Nahmnam, were both killed while driving in Gaza City. The Army of Islam is an increasingly popular Salafi terrorist group that wishes to see Gaza run by Sharia (Muslim law). Army of Islam fighters have occasionally clashed with Hamas, which has instituted sharia law in Gaza, but only partially.